As a gift, I offer this photo array of a Nativity set crafted by Elias Giacaman of the Holy Land Arts Museum owned by Joseph E. Giacaman & Sons Co. Elias studied the scale of the Separation Wall in Bethlehem relative to the average height of people living in Bethlehem. 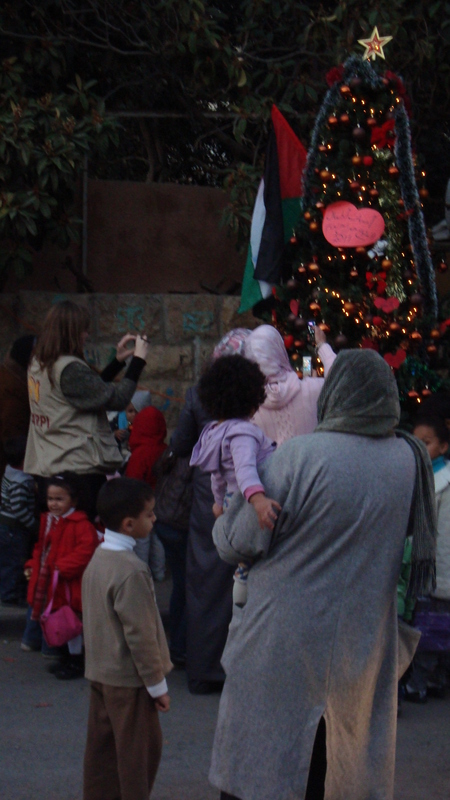 ﻿﻿﻿﻿﻿On 20 December 2010, we attended the Christmas party in ﻿Sheikh Jarrah, an East Jerusalem neighbourhood in which Israeli settler groups have forcibly evicted the Palestinian, Al-Kurd, Hanoun, Al-Ghawi, and Rifhqa Al-Kurd families from their homes. Since late 2008, more than 60 Palestinians, including 24 children, have been forced onto the streets. 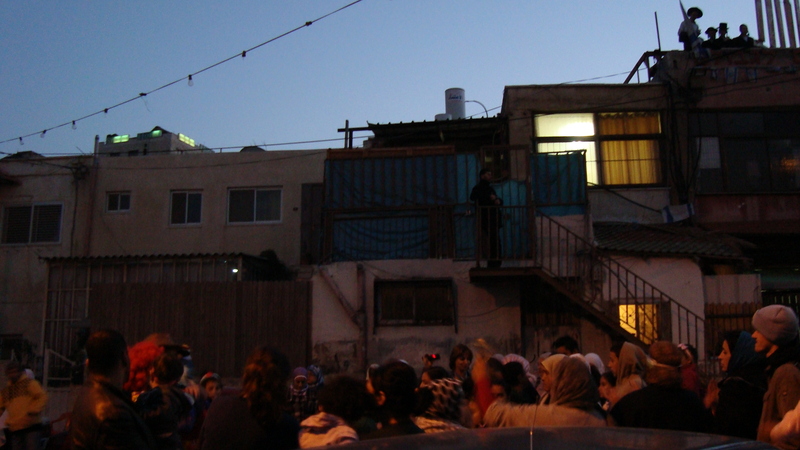 Even as the settlers looked on, the evicted families celebrated and shared their hopes for 2011. 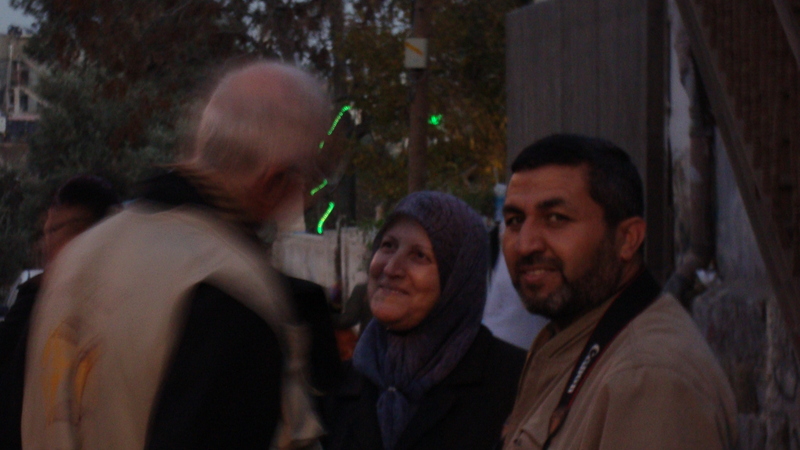 See news articles about Umm Kamel, a woman who has become one of the faces of Sheikh Jarrah. Also, see this October 2010 report from the United Nations Office for the Coordination of Humanitarian Affairs. ﻿On 20 December 2010, we received this report: ﻿Human Rights Watch. (2010, December). Separate and Unequal: Israel’s Discriminatory Treatment of Palestinians in the Occupied Palestinian Territories. New York: Authors. ﻿﻿Demolition Working Group Alert 12:01 pm – Demolition ongoing of a Palestinian (inhabited) home in Ras al Ahmud in East Jerusalem. On 22 December 2010, we responded to a request from the EAPPI UK/Eire Coordination office. They have asked us for quotations from Jerusalem residents, to be printed on a leaflet for use during World Week for Peace in Palestine and Israel (29 May – 4 June 2011). Note: Having already turned 16, she cannot visit Jerusalem except during Ramadan or if she has a health problem and if she can obtain a health permit. On 23 December 2010, two of us attended Sabeel’s Communion service at 12 pm. 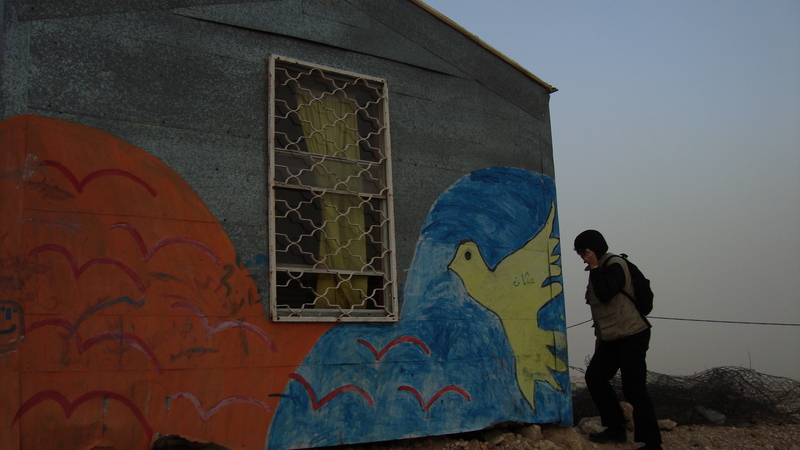 Sabeel is the Ecumenical Liberation Theology Center in Jerusalem. The centre was founded by Rev. 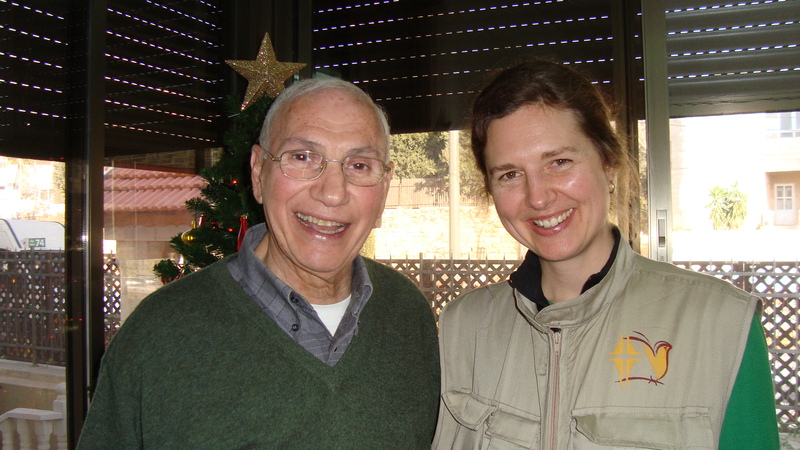 Dr. Naim Ateek in 1990 and works for justice, peace, and reconciliation in Palestine-Israel. The word, sabeel, is Arabic for ‘the way’ and also ‘a channel’ or ‘spring’. The weekly service is open to the community and facilitates a wave of prayer through the world’s time zones as individuals and groups pray together in solidarity with Sabeel in Jerusalem and with Friends of Sabeel worldwide. On Thursday, Rev. Ateek invited us into conversation about what is righteous in a time of Occupation and how people might rise above unjust laws. He invited us to remember the meaning of the name given to Jesus, Emmanuel: “God with us”. We are not alone. It is happening again. Apartheid. Separation. I heard the word, apartheid, in late April 2009 in Bethlehem. The Rev. Dr. Mitri Raheb used it during a conversation that he had with a group of 22 of us from Canada. One of us had asked him for his opinion about the conflict. I remember him saying that in the immediacy of the Lutheran ministry in Bethlehem, he was encouraged for the tremendous international support for the ministry. We were meeting in the beautiful space of the International Center of Bethlehem, Dar Annadwa Addawliyya ( دار الندوة الدولية‎). But he said, in terms of the bigger picture, ‘we are on our way to fully formed apartheid’. I remember that moment as though I did a physical, mental, and emotional double-take. What? On the last day of that trip, the experience at the Qalandia checkpoint on the north side of East Jerusalem with Machsom Watch was a second shock to the system. A few of us witnessed the cattle-like processing of Palestinians through cages as they attempted to move from the West Bank to work, to school, and to hospitals in East Jerusalem. Upon returning home in May 2009, I was moved to apply to EAPPI. And so, here I am. I’ve been here for ten days. Today, on a tour with Angela Godfrey-Goldstein from the Israeli Committee Against House Demolitions (ICAHD), my mind and soul shuddered awake again… She explained that the word, apartheid, is Afrikaans for “separation” or “apartness”. “Of course! !” my mind, soul, and body cries. Of course! This is what I’m seeing…in the blatant differences in municipal infrastructure on one side of Road No. 1 (the municipal name for the Green Line) – the West-Jerusalem side is spacious and bright – the East-Jerusalem side is crammed and crumbling. This is what I’m seeing as three types of armed personnel stand and roam the streets of the Old City with assault rifles. This is what I’m seeing when Israelis use only the Egged Busses and Palestinians use the ‘Green and Blue’ buses. This is what I’m seeing on the Ministry of Tourism map of The Old City of Jerusalem – that shows only Israeli parts of the Old City and sketches in parts to be built after evictions and demolitions (e.g., the Old City of David where the Palestinian neighbourhood of Silwan actually exists). This is what I see in the incomprehensible differences between (1) Bedouin villages on scraps of land being taken over by the settler-only access roads and municipal garbage dumps and (2) illegal settlements. This is what I see in the Separation Wall. This is what I see in the need for the Kairos Palestine document as comparable to the Kairos document published by black South African theologians in 1985 regarding South African Apartheid. 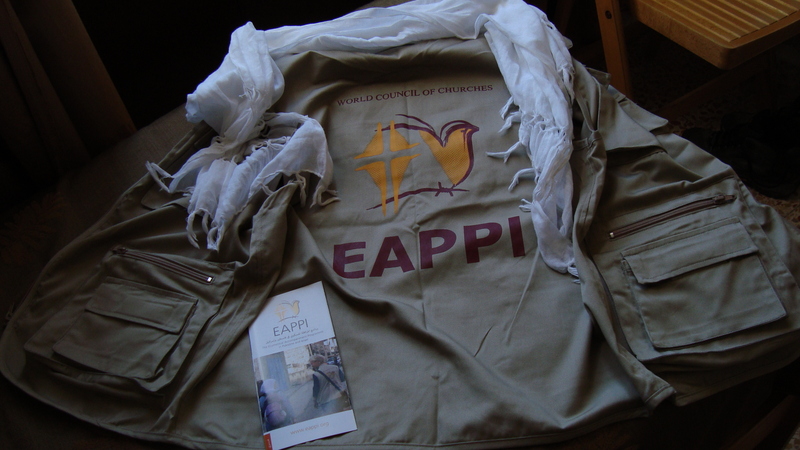 Also, this week, the members of EAPPI Group 38 were invited to Bethlehem to join an international delegation of women and local Heads of Church to mark the one-year anniversary of the release of the Kairos Palestine document. People spoke in hope, in faith, and in love that next year, on the second anniversary, we will be closer to peace. Rev. 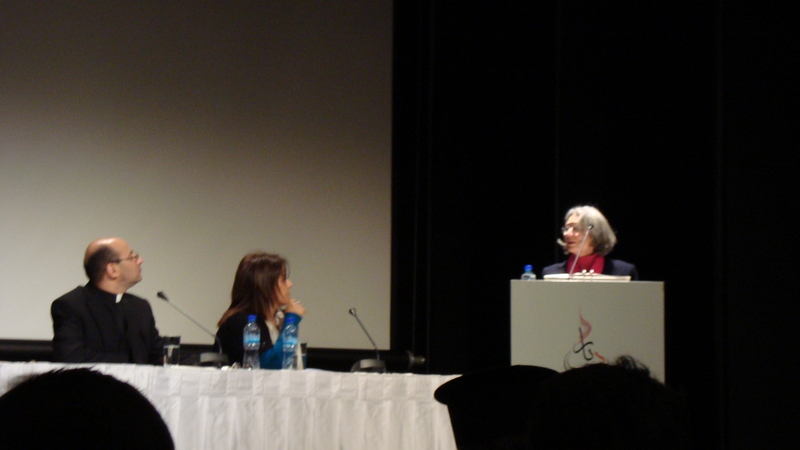 Dr. Mitri Raheb, one of the authors of the document, moderated the panel discussion. And so the circle comes around. Apartheid. Separation. Now, I find myself here with 24 other EAs from around the world, to offer protective presence to vulnerable communities, to monitor and report human rights abuses, and to support Palestinians and Israelis working together for peace. Now and when we return home, we will campaign for a just and peaceful resolution to the conflict through an end to the occupation, respect for international law, and implementation of UN resolutions. Angela Godfrey-Goldstein began her tour with these words about this apartheid state: “It will change only when ordinary people understand what is going on.” Our political leaders need to hear from us. I will write more on all of this in the coming weeks and months…from the City of Peace. We’ve been in ‘learning mode’ with our mentors from Group 37, bunking in with them since Thursday evening. Today, Monday, we’ve returned to the hotel with the 21 other members of Group 38 for training through the end of this week. Through email and now in person, we are starting to hear about the experiences of the other teams (e.g., in Yanoun). 11 Dec 2010: Slept in a bit – Catching up on the jet lag!! Morning – Read the Handover report (from Group 37 to 38) and one of the UNOCHA (United Nations Office for the Coordination of Humanitarian Affairs) reports – polished the WallArt4Peace blog – did a little emailing. 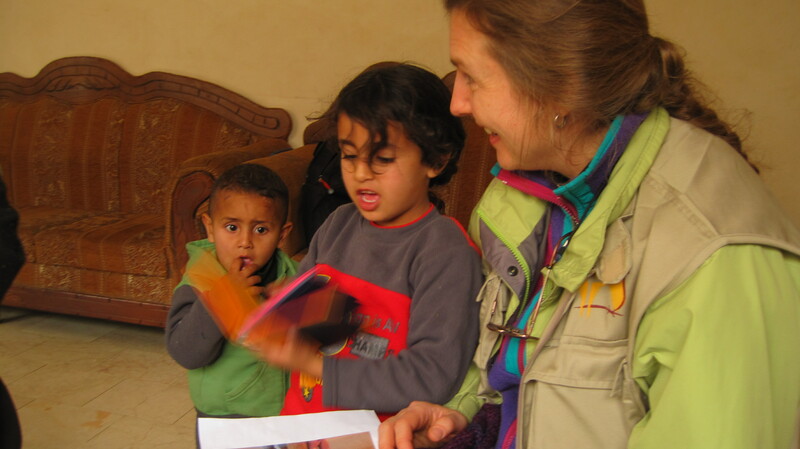 Afternoon – Went with two of our EA mentors (both women) to Jahalin Bedouin village in Al Ezariya and spent the afternoon with our host, her sisters, little nieces and a nephew, and the English class for 15-16 year old girls. – Back home for a joint Jerusalem Team 37-38 meeting to discuss the Handover report. – Out to the Educational Bookstores – at one, I bought a notebook and 2 pencils and at the other, I bought the recently arrived Against the Wall book. (See my WallArt4Peace blog for more info.) Then bought a slice of pizza for a late supper and crashed. Today, after a 6-hour stretch of sleep, we were up at 4:23 am (leaping out as our two EA mentors walked by our sleeping quarters) to meet the 4:40 am taxi for Qalandia checkpoint. What a windy and relatively cold morning…I’ll write more about checkpoint duty in the future. Our host graciously described the Jahalin story. In the mid-to-late 1970s, members of the extended Jahalin family were forced to leave their traditional way of life and the lands in which they used to live in the Negev desert near Beersheba. They moved north and then north again, living initially east of Jerusalem. 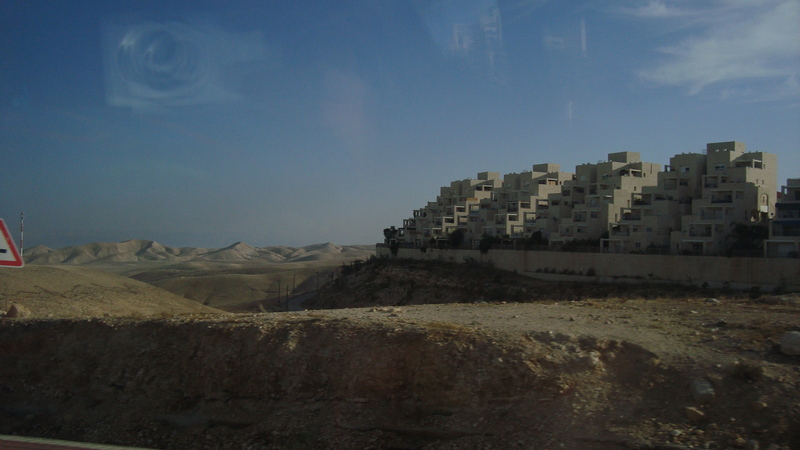 However, with the establishment of the illegal Ma’aleh Adumim settlement, they were moved to the top of a nearby hill, near Al Ezariya (also known as Bethany and the place where Lazarus was raised from the dead). They had erected corrugated metal shelters as homes. On a day like we had on 11 Dec. 2010, with the winter wind howling and dust flying, that would have been a hard, desperate life. After a number of years, they were granted permission to build permanent structures. Even then, however, those permits are good for only 40 years and the village is downwind from the municipal garbage dump where garbage is burned. On a fair weather day, the air quality is questionable; on the day that we visited, severe winds were scouring the hilltop. Once they moved into these new homes, circumstances demanded further change of the Jahalin. Bedouin traditional life of the past was a nomadic life, as they moved their camels, sheep, and goat herds according to the seasons and the availability of water. Regular movement was healthy for the land (to avoid over-use) and for their interdependence with the land. Our host remembered her father’s skepticism of their move into permanent, enclosed buildings as homes. For him, the prospect of living inside a building was not a healthy one. For example, he worried that electric light would damage their eyes. She rememers how their eyesight used to be acute and well-adjusted to the night sky. Note: If you’re interested in learning more about the Jahalin family’s experiences, see the recent Separate and Unequal publication (p. 120) from Human Rights Watch. 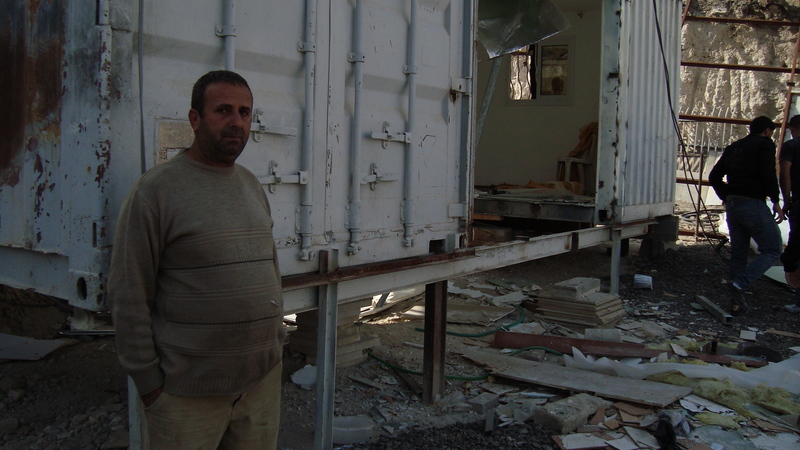 I’ve found this page which is very consistent with what we heard first-hand on 11 Dec. 2010. http://www.badil.org/en/al-majdal/item/1219-israel-continues-to-evict-jahalin-bedouin-from-west-bank-%5C And, here is a contemporary (1996) news report: http://www.wrmea.com/backissues/0796/9607065.htm . 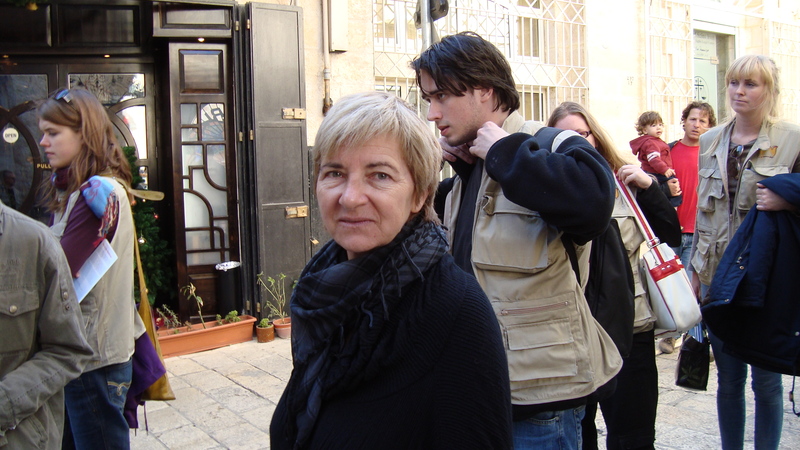 We, the members of EAPPI Group 38, started arriving in Jerusalem on 7 Dec. 2010, from around the world. We’ve begun to meet members of Group 37. Between these two groups (and more EAs are yet to arrive), we represent: Australia, Austria, Canada, Finland, Germany, Ireland, Norway, Palestine, South Africa, Sweden, Switzerland, United Kingdom, and the United States of America. Members of Group 37 introduced us to key spots in East and West Jerusalem yesterday and today and we were given our EA vests!! Over the next few days, Group 38 will be learning from Group 37 about our work in Jerusalem. We will be watching checkpoints (in which Palestinians must move from one type of zone of the West Bank to another and/or into East Jerusalem); standing with the Women in Black; providing an international presence in villages in East Jerusalem with eviction and demolition orders, and more. “Talking about place, where we belong, is a constant subject for many of us. We want to know if it is possible to live on the earth peacefully. Is it possible to sustain life? Can we embrace an ethos of sustainability that is not solely about the appropriate care of the world’s resources, but is also about the creation of meaning – the making of lives that we feel are worth living.” -bell hooks. (2009). Belonging: A culture of place. New York: Routledge, p. 1.